Last week, we hosted a weeklong training session with our newest consultants to glo! While a lot of what they're learning is scientific methodologies behind our products, one of the more hands-on sessions (and probably the favorite day of the week) is the glominerals demonstration! Our consultants play the roles of client and artist as they learn the proper techniques for applying our mineral makeup. Welcome to gloProfessional ladies! Leah uses the liquid foundation brush to apply our glominerals gloSheer tint to Tara. Tara applies a wash of orchid gloEye shadow to Ana using the eye base brush. 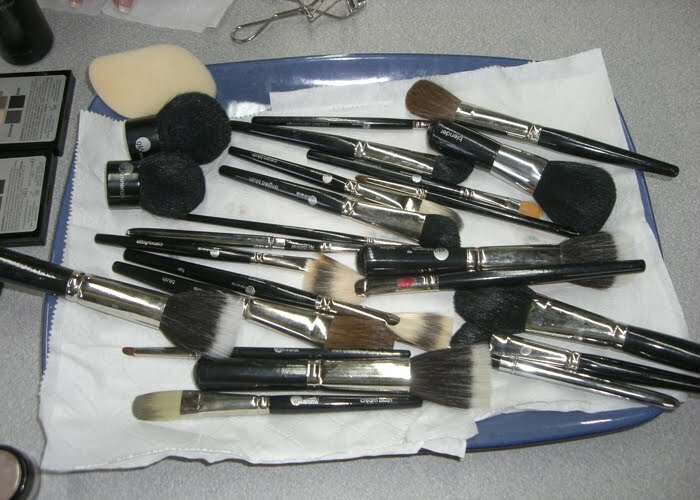 Tools of the trade - the right brush is a must for proper application!